Empty lot behind trash sculpture fence on First Avenue. Another empty lot… in the East Village! 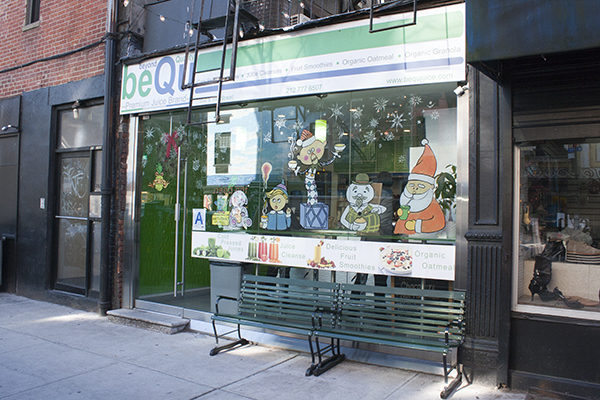 Eleven days ago or so, I posted something about paint being used to spiffy up the front of a store on East 9th Street. Embellished vs. non-embellished scaffold supports. From the scaffolding to the building. 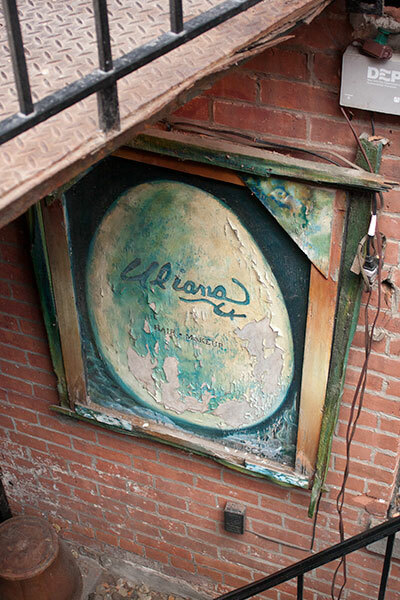 I can't wait to see what it'll look like — the East Village just keeps getting better… looking! 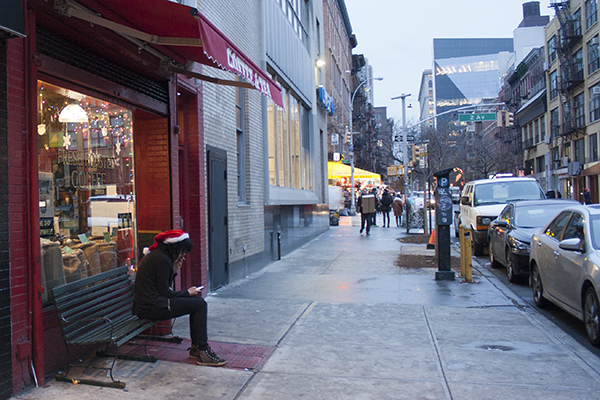 Christmas is winding down, decorations are being put away, Winter now unofficially begins… in the East Village! People say to me, they say: "East Village Today, what do you do when you're out and see some wrong that needs to be righted? Well, the answer is: I fix it! 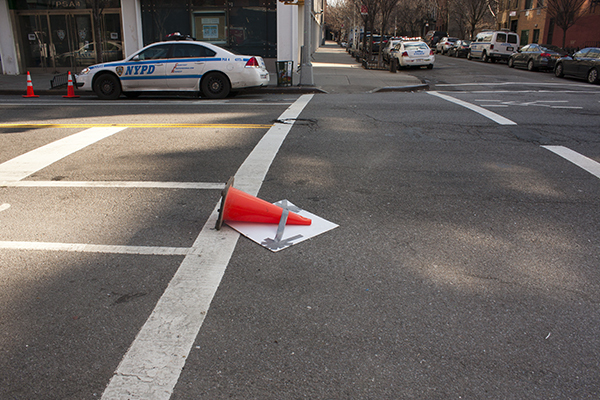 Traffic cone and sign, face down. Traffic cone and sign, face up. It's hard to know, in situations like these, if the fix is accurate. 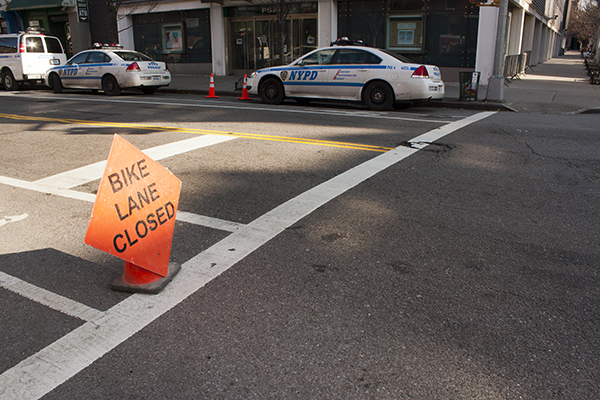 For instance, the sign is pointing in a direction against the flow of bicycle traffic. Was it meant to be this way? Traffic cone and sign, facing the right way. 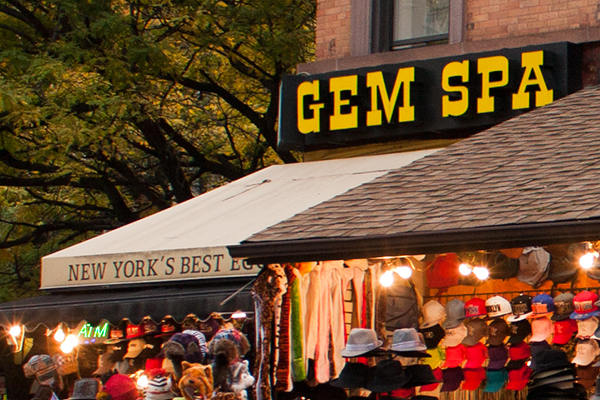 There's only so much you can do… in the East Village! The cast of Rudolph, at beQu. 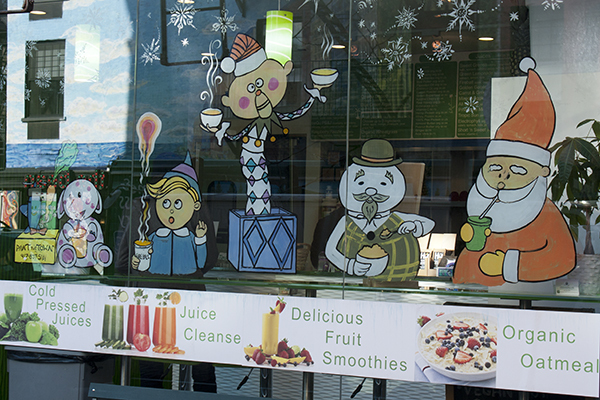 The Spotted Elephant, Hermey, Charlie-in-the-Box, Sam the Snowman, and Santa himself were all hanging out at beQu Juice! The East Village is very much like the Island of Misfit Toys: cool characters all trying to fit into a world that doesn't seem to care. EV Grieve is the name of a blog. According to a recent post, it's been around for seven years. It was named the best neighborhood blog by one of the free, weekly newspapers. 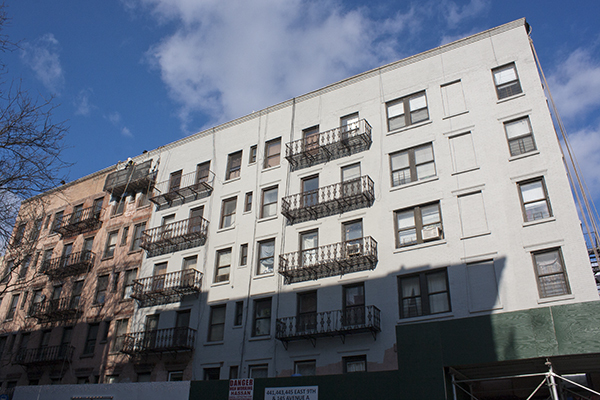 Why does EV Grieve shun East Village Today? Who knows? 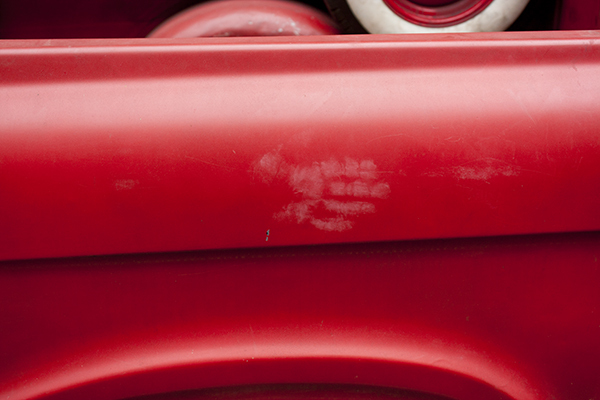 I can only tell you what happened. I started this blog back in August of this year. I have two rules about posts here and comments elsewhere: I never complain; and I never argue with commenters. As soon as I started posting comments on the EV Grieve blog, I came under immediate attack by other commenters. I refused to respond. Soon, one of them suggested that I was a "bot". A bot! Right away, the EV Grieve blogger implemented the captcha device, which requires commenters to enter words or numbers before the comment can be submitted. 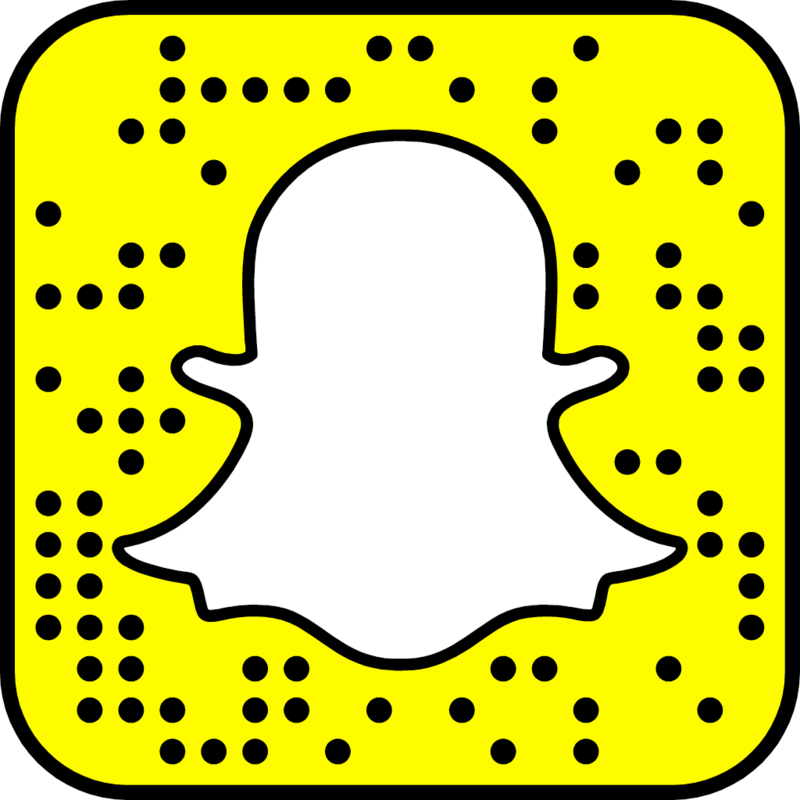 This device prevents automated comments from bots. Of course, since I am not a bot, I continued commenting. Once he saw that, he banned all of my comments. He also banned me from viewing his tweets on Twitter. That was in November. 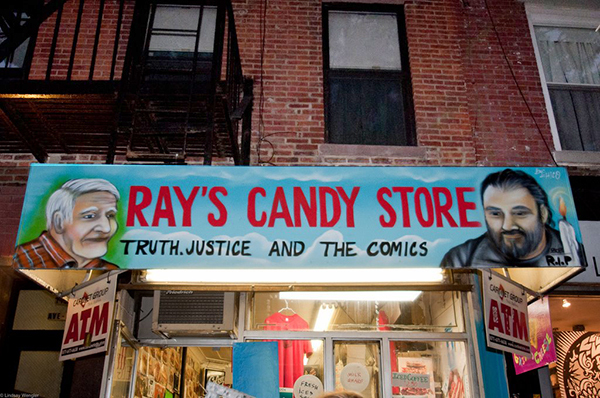 Ray's Candy Store awning, quite clean. 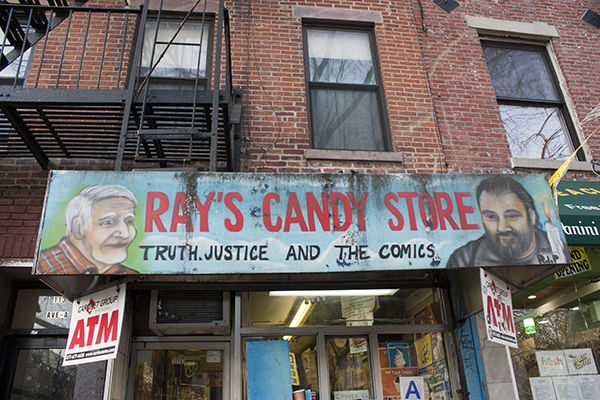 Ray's Candy Store awning, covered in filth. Lately, I've been writing about the competition that's risen between Ray's and Avenue A Classic Food, a store that recently opened next door. Then, the other night, I wanted to check Ray's Twitter page, and I found that I was banned from it! The last tweet of mine that shows up beneath one of theirs is dated December 4, so it happened some time after that. That's it. There might be others, but they're not people/blogs I follow, so I'm not aware of them. Even these two are hardly worth mentioning, but since it's the end of the year, the time when people tie up loose ends, I decided I'd dispense with it. 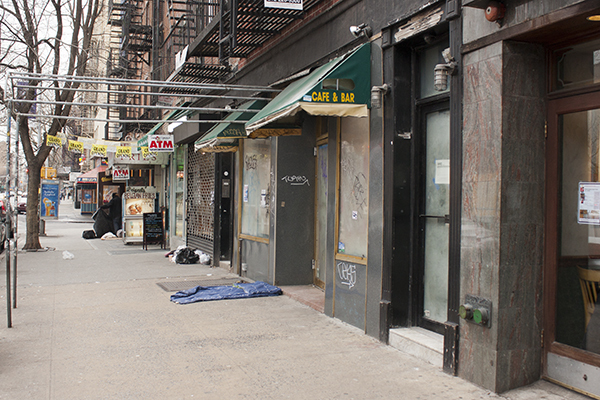 But this is East Village Today — East Village Today doesn't look back! So stay cool, East Village, and get ready for an awesome 2015! Old-fashioned bicycle wrapped in plastic and tape. They probably taped the sign across the basket to discourage people from putting their trash into it! 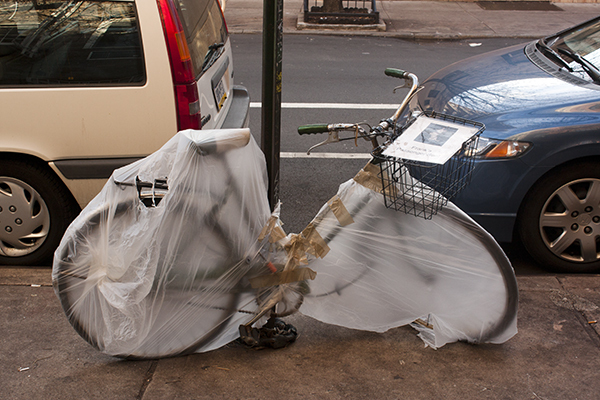 Another old-fashioned bicycle wrapped in plastic and tape. I wonder how comfortable these bicycle baskets are for small dogs — it seems the wires would press between the pads in their paws! Plus, how safe can those things be! 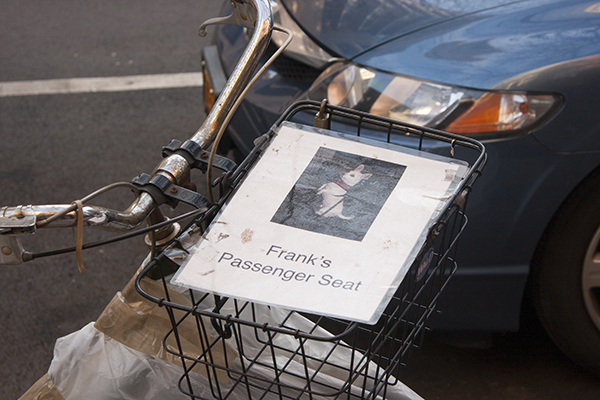 I also wonder if one person has two bikes, one for each dog. 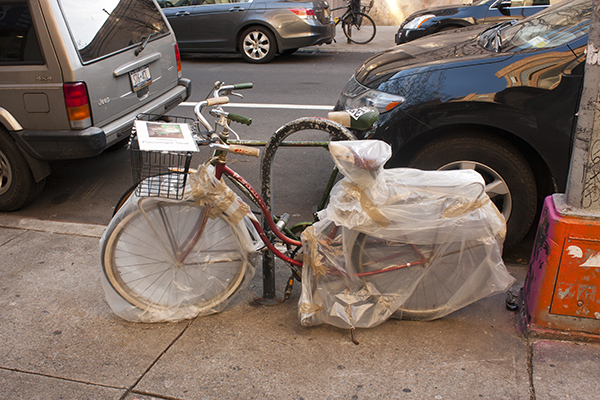 I also wonder how often these bikes are used, wrapped up in plastic and tape, as they are. 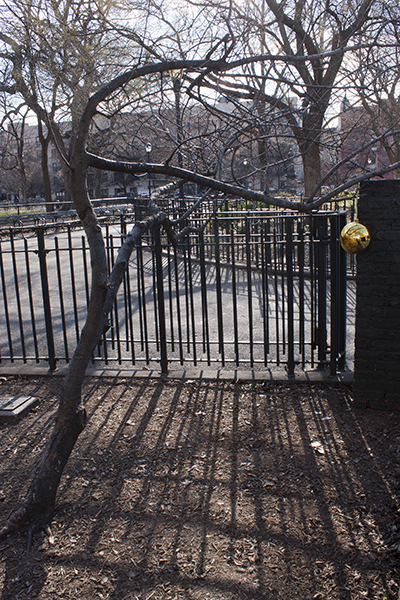 Wondering, wondering, wondering… in the East Village! Local Starbucks with railings on the ground. I thought to myself, as I passed: That railing extends beyond the distance allowed for sidewalk cafés! All sidewalk cafés must maintain a minimum clear path of eight (8) feet between the outer limit of the café and any object near the curb, including the curbstone. When a sidewalk is wider than 16 feet, the amount of clear path must be 50% of the distance from the building to the curb line. Local Starbucks railing now within the legal limit. 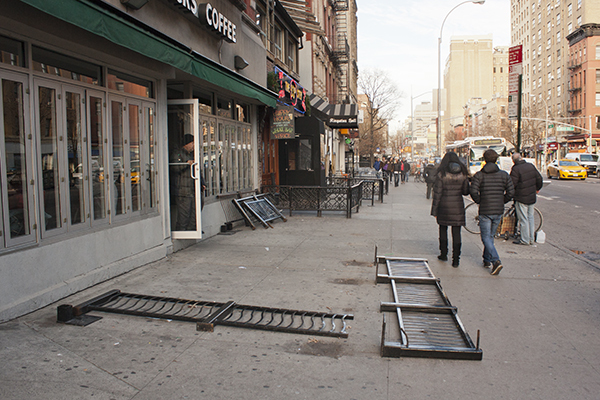 Keeping the sidewalks clear… in the East Village! Artist painting The 13th Step. 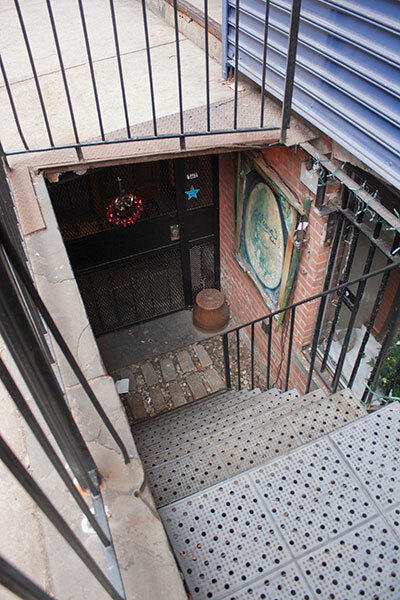 An artist was painting a picture of The 13th Step, a popular bar in the East Village. It's never too early to begin creating the memories of tomorrow. In some ways, that's exactly what I'm doing! The front doors are open. Keep in mind that East Villagers love to keep their doors open! There you have it — you will probably never see inside this building again! Unless you buy it. 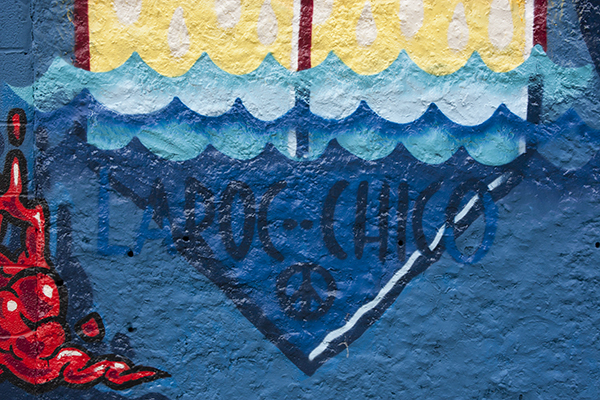 If you're a regular reader of this blog, you'll be familiar with ongoing coverage of events like the Number 2 on the sidewalk outside the very groovy Earth School, or the Cool Old Pickup Truck. Rather than update these two stories separately, I decided to update them together! Orange cone in bed of truck. 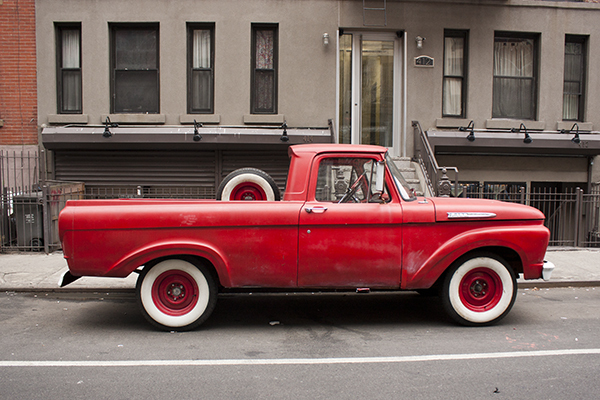 The cool old pickup truck has an orange cone in the back! What next?! 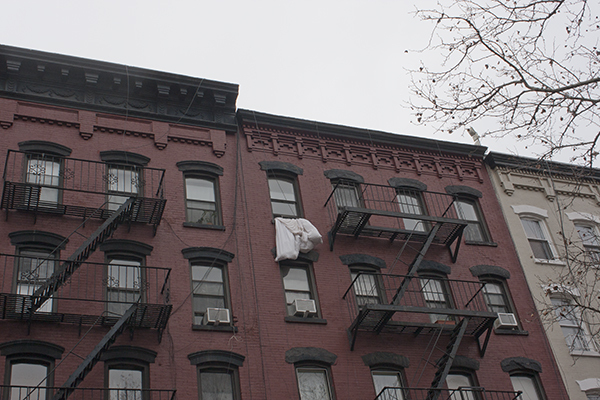 You never know what to expect… in the East Village! 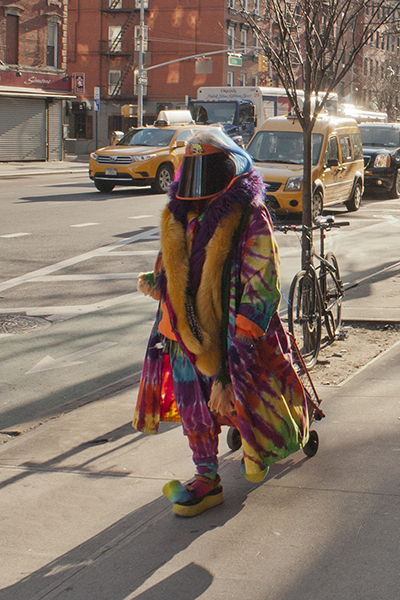 People have asked me, they've said: "East Village Today, can you post a picture of a typical East Villager"? This is why people move to the East Village! There's an old saying, "Don't defecate where you eat". 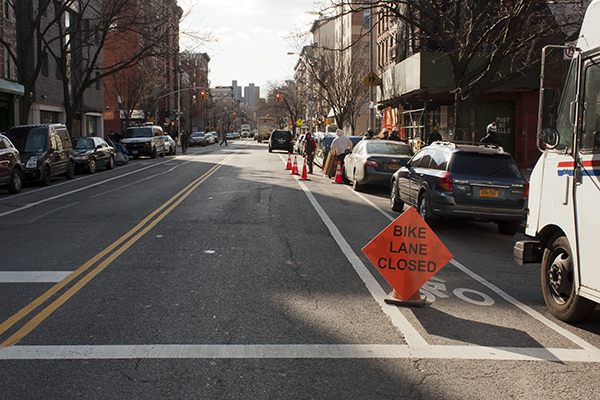 In the East Village, where space is at a premium, the distance between the two can be very small! Hi everyone! I hope you had a great Christmas — I sure did! You may have noticed that I didn't post anything these past few days. Like everyone else who didn't sever ties with humanity when they moved here, I was out of town. But now I'm back, and I've got some surprising (shocking, some might say) end-of-the-year stories to tell about… the East Village! It doesn't get more East Villagey than this! 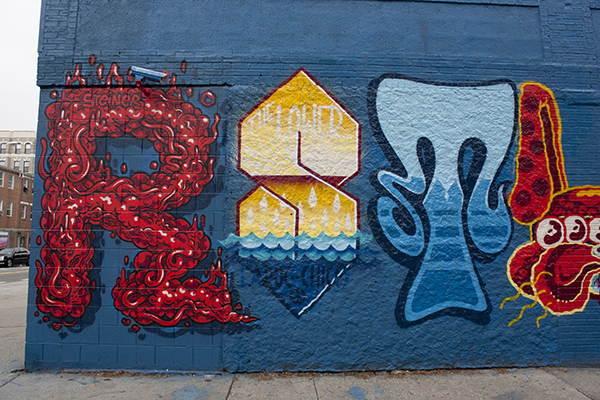 The muralists are including commemorations to past and present graffiti artists! You'll also see "Steiner" on the R in the first picture. I wonder how many more there are — every letter is probably a commemoration to someone! 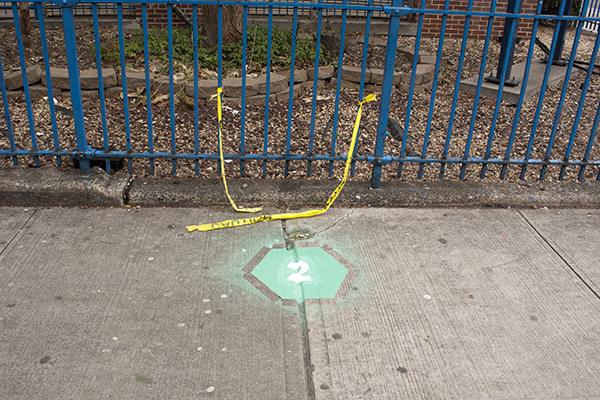 A few days ago, I wrote about the excess of caution being taken around some paint on the East 6th Street sidewalk in front of the very groovy Earth School. Green hexagram now sports white No. 2. The orange cone is gone, the caution tape is broken but still attached to the fence, the masking tape is gone from the sidewalk, and a white no. 2 is in place! It's hard to tell what this is. It's also hard to tell if it was intentional or not that one of the wires hanging outside the front of the building is holding everything in place. I wouldn't want to be the person whose window this is in front of! This scaffolding was also decorated for Halloween! I said it once and I'll say it again: East Villagers love Christmas! A new twist has emerged in the Avenue A cigarette price wars! For a quick update: read this. 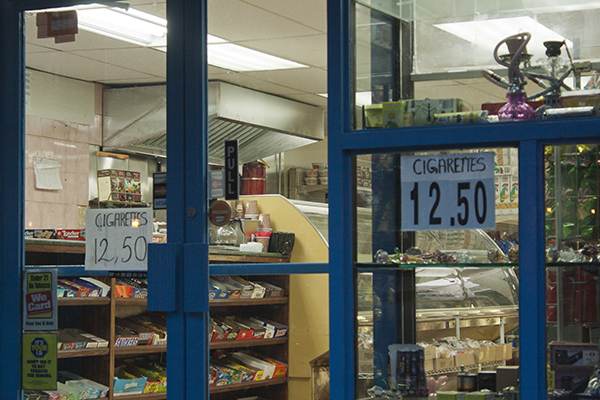 The Sahara Deli, a little further up Avenue A from Rays and Classic Food, now sells cigarettes for $12.50! 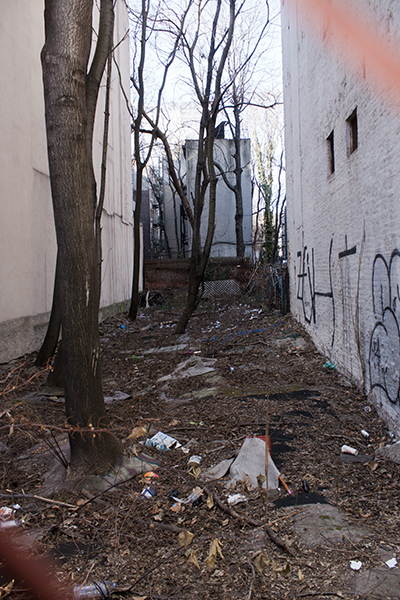 Derelict section of Avenue A, below Sahara Deli. It's funny, the thinking that goes into something like pricing cigarettes… in the East Village Today! 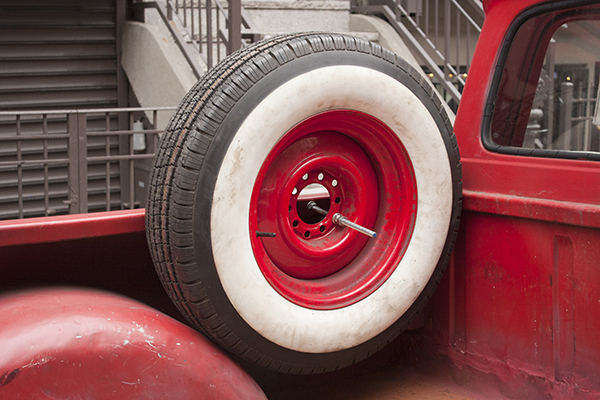 Spare tire mounted in bed. The spare tire is now mounted in the bed of the truck! 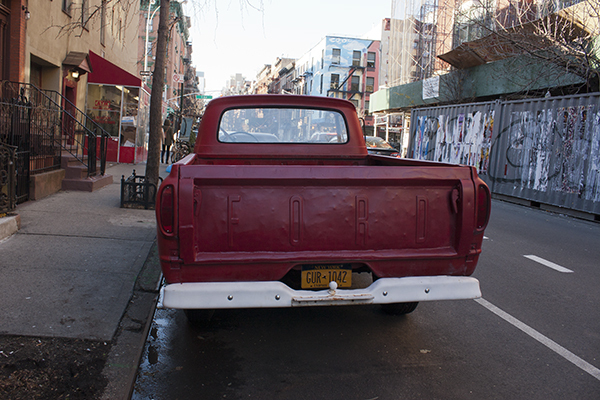 Back view of cool, old pickup truck. 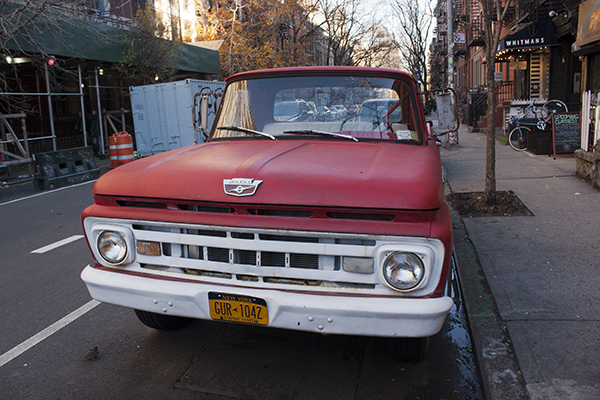 Front view of cool, old pickup truck. It's not the straight-on shot I wanted, but it's hard to get those with other cars parking in front and in back of this truck. 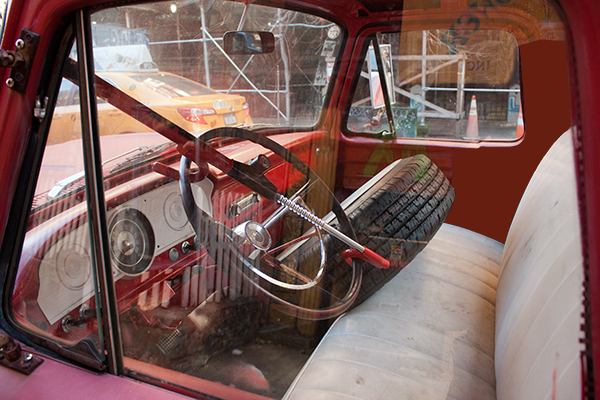 Renovations to the West Virginia building and pickup truck, all at the same time — things are looking up… in the East-9th-Street-West-Virginia East Village! 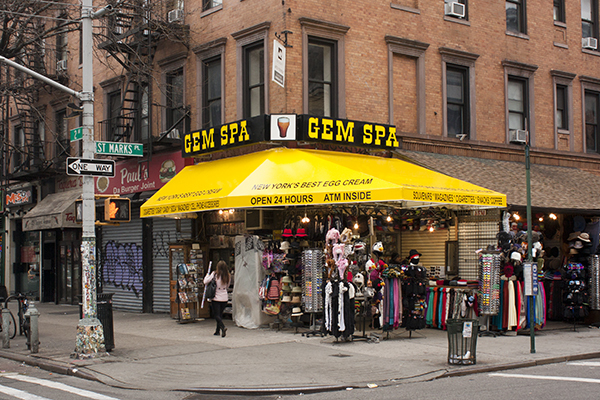 Gem Spa awning, on left. 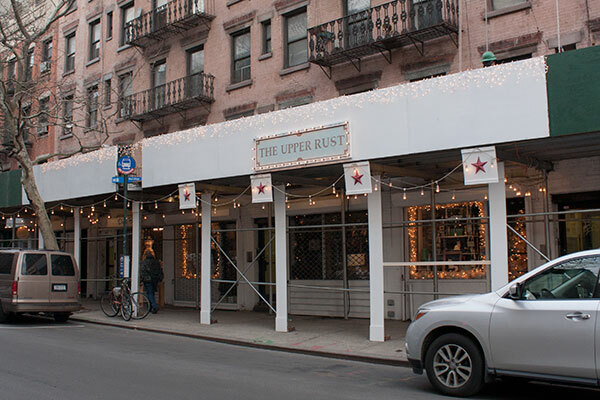 The new awning extends further, to align with the to the right of it, on St. Mark's Place. It also matches their letters! There is a space before and after each asterisk, except for the last one — there's no space between the asterisk and the word "coffee". I'll never be able to look at this awning without seeing that! It looks like they're playing down the egg cream bit, moving it up onto the angled panel of the awning, where it's not as easy to read. 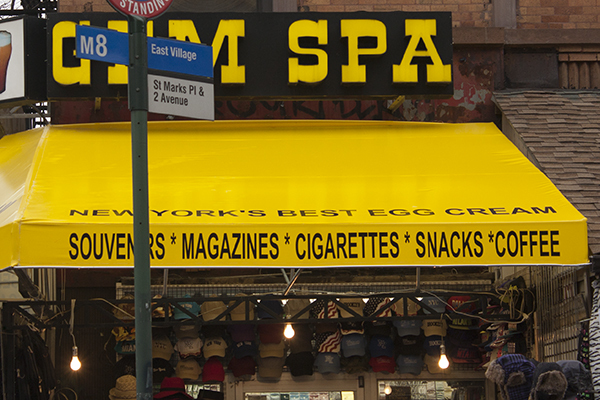 I guess having New York's best egg cream is not as important as souvenirs, or an ATM inside. Still, it's a darn fine awning, and East Villagers are delighted to have it! Bottom step repaired, rickety old gate removed. 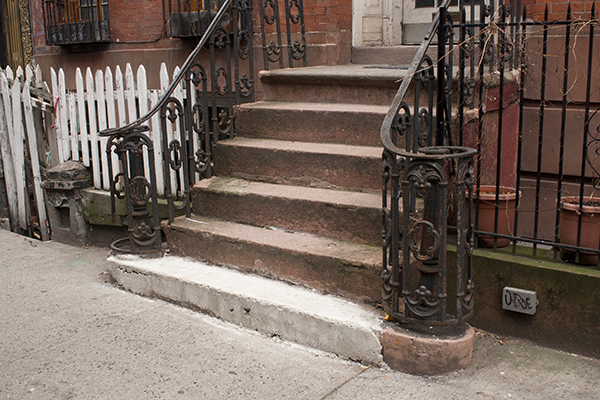 The East 9th Street West Virginia building has begun repairs on the stoop! They removed the rickety old gate, and fixed the bottom step. This is truly remarkable — there is no question that East Village Today had something to do with this! East Villagers love to be prodded into action! 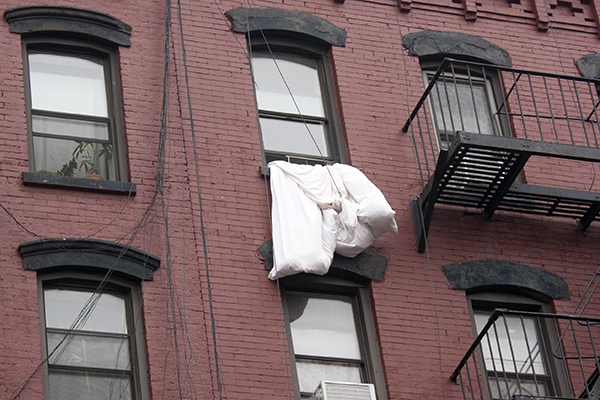 I can't help but think that this blog has been instrumental in prompting people in the East Village to fix things up a bit! A little paint works wonders. Recently, this white area was the same color construction-site green as what borders it on either side. 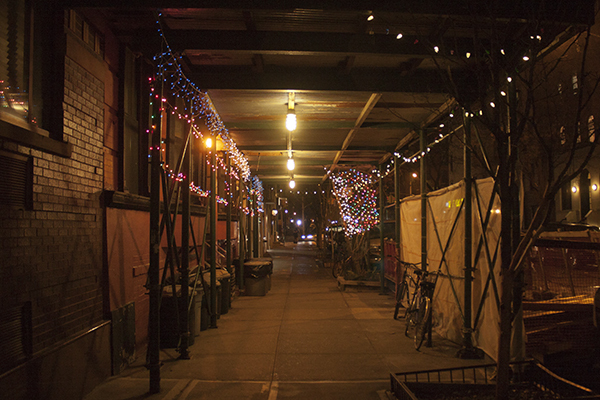 It might only be for the Christmas season, but the point is made nonetheless — paint works wonders… in the East Village! Uliana ~ Hair • Makeup. I wasn't sure if I was reading this correctly: "U…l…i…a…n…a", so I Google'd it. It turns out Uliana is quite famous, and by the looks of her web site, quite an accomplished color specialist and makeup artist! Which naturally leads me to the question: What's up with that sign?! I get the whole understated thing. I'm not saying she should move above ground, or into a fancier place, I'm just saying: replace that sign! And do something with those electrical wires — it's not safe to have those plugs exposed like that. Why Did the Bird Cross Avenue A? 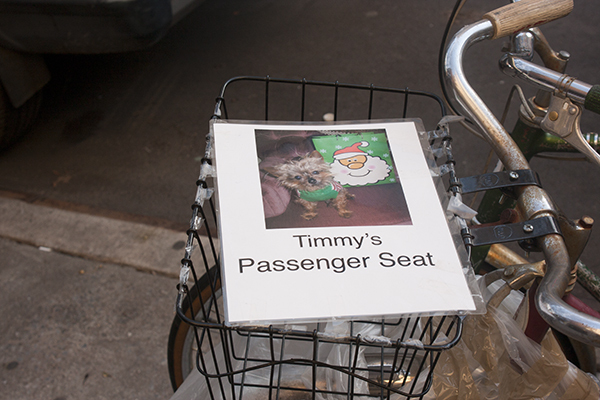 Not Just Any Bike – AnnieBike! The East Village is What?